Tannoy's flagship in-wall speaker, combining the latest Dual Concentric driver technology, a SuperTweer and an auxiliary bass driver for extended LF response. Tannoy IW 62TDC In Wall Speaker uses a large format chassis built from UV stabilised ABS, leveraging the performance of the class-leading IW6TDC while adding a second 165mm (6.5") bass driver for astounding bass response down to 35Hz. Solidly built and capable of withstanding continuous 120 Watts RMS power handling and short term peaks up to four times that power, the IW6TDC’s high-efficiency design (92 dB/Watt) means it is capable of exceptional high peak SPL and outstanding dynamic range. For fine tuning the speaker performance to the room, a front mounted switch gives +/- 1.5 dB adjustment on the HF output energy. High-end features include the ability to bi-wire or bi-amplify the IW62TDC for peak audio performance using the dual pairs of gold plated spring terminals and unique fifth terminal. The unique fifth terminal grounds the driver chassis and reduces RF in the system, decreasing the potential for hum and improving sound quality. 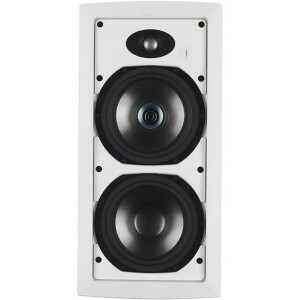 Eight of Tannoy’s unique self-aligning clamps are used to fit the IW62TDC rigidly into the wall cavity, creating a solid and stable platform for the drivers.